Safe access protects building services engineers installing and maintaining plant. To ensure this, ECEX has a highly experienced team operating from our workshops in Newbury who can survey, design, manufacture, refurbish and install metal fabrications of all descriptions. ECEX specialises in steel fabrication for access safety including bespoke platforms and railings. 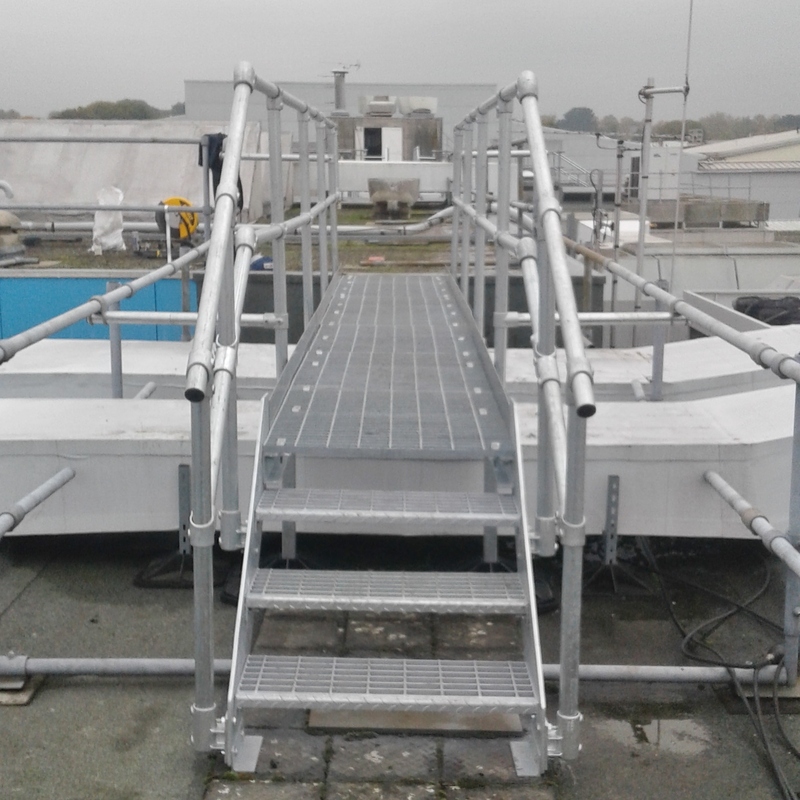 We also provide cost effective solutions to eliminating trip hazards on roof and internal plant rooms, including step-overs to pipework, ductwork and other obstructions; platform extensions, and bespoke walkways and access gantries to cooling towers, chillers and air handling units. And ECEX is a specialist in the field of roof edge protection guard railing, helping to create a safe working environment for maintenance and service personnel. Services include free standing edge protection to avoid roof penetration; tubular steel guard railing fixed to roof surface or parapet wall; toe boards and kick plates, and handrail extensions/modifications. ECEX will create the best solution, taking into account all relevant design standards and legal requirements using a combination of standard components and factory fabricated metalwork. We can supply and install access ladders; riser infill platforms, and hooped ladders. We also have many years’ experience with staircases and can offer fire escape stair inspection and condition / fitness-for-purpose reports, repairs and refurbishment, and anti-slip tread covers. Furthermore, the company is an expert in mesh security caging; fan guards; COSHH enclosures; stainless steel kick plates and pillar trims, and GRP stair and landing treads. Finally, we can provide qualified rope access technicians or permanent harness line installations and alterations, including eye bolt testing and installation, and harness line testing and installation. All work complies with the latest Work at Height Regulations.